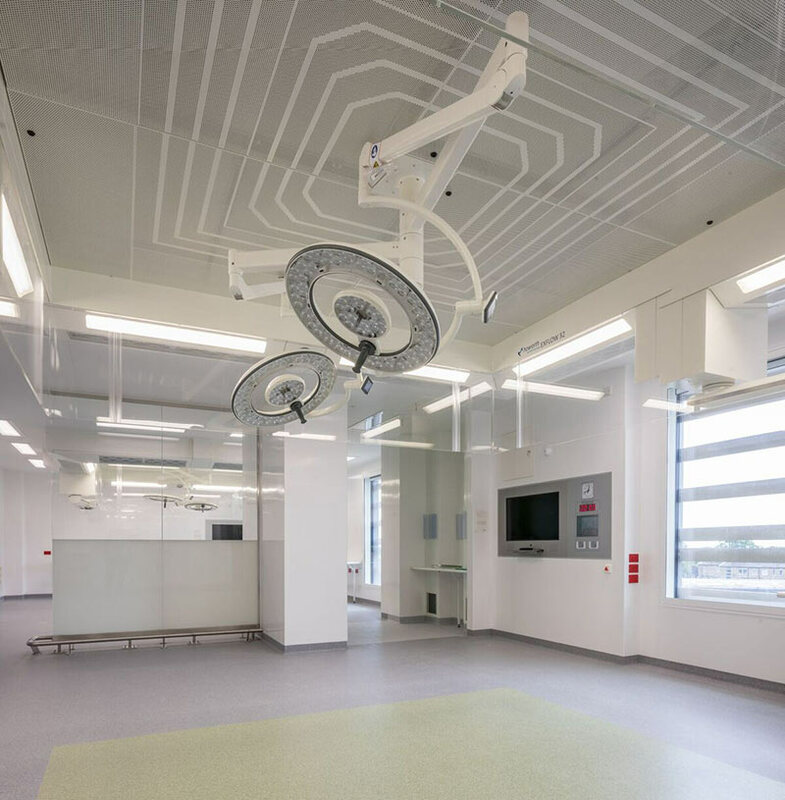 Operating theatres and critical care areas at the new Chase Farm Hospital in Enfield are equipped with advanced LED surgical lighting, touch screen theatre control panels, medical IT (IPS) power systems, and uninterruptible power supplies by Bender UK. The new 20,000 m² Chase Farm Hospital is part of the Royal Free London NHS Foundation Trust group. It has been designed to provide world class facilities and will be the location for most of the Royal Free London’s planned surgery. It has eight operating theatres, a dedicated day surgery area and 50 surgical in-patient beds. A key element in the design concept for the new hospital is more innovative use of operating theatres. Increasing planned surgical work at Chase Farm Hospital will enable the Trust to use its facilities and staff in the most effective and efficient way. It will also help to free up space at Barnet Hospital for medical and surgical emergencies and allow the Royal Free Hospital to focus on specialist surgery. In particular, orthopaedics, ear, nose and throat, maxillofacial, general and gynaecological surgery will mostly be carried out at Chase Farm Hospital. The eight main operating theatres include four ‘barn theatres’ specifically designed for orthopaedic work. The term ‘barn theatre’ refers to the open-plan design of the main surgical area, where each patient is treated in a dedicated space alongside the next patient, with a specialised air canopy over each station to prevent the spread of infection. The barn theatres have adjoining anaesthetic rooms and traditional recovery areas. Benefits of barn theatres include lower infection rates, improved safety and enhanced team working. Each of the new theatres is fitted with two sets of the state-of-the-art Merivaara Q-Flow™ lighting for which Bender UK is the exclusive supplier in the UK and the Republic of Ireland. Q-Flow™ lights provide advanced performance across key areas, including best-in-class colour rendering vital for surgeons and theatre staff to monitor the health and well-being of patients. The Q-Flow™ range has a sleek, streamlined ‘light-within-light’ construction designed to work more effectively with ultra clean air canopies by providing an uninterrupted vertical flow of sterile air to the operating table, minimising the turbulence that can introduce bacteria at the operation site. Current standards recommend that turbulence intensity disruption of clean air flow caused by surgical lights should be less than 37.5%. The turbulence intensity of the Merivaara Q-Flow™ surgical light is a best-in-class 15.91% - exceeding the recommended standard by more than 50%. Another unique feature of the Q-Flow™ lights is the innovative Dynamic Obstacle Compensation™ system developed by Merivaara to minimise shadows in the light field. it delivers more light to the operation site, reducing fatigue for the surgical team, and minimising risk for patients. During on-site tests to assess the lights, the effectiveness of the shadow reduction system is a key advantage recognised by clinical staff and surgeons. The theatres are equipped with Bender-manufactured hygienic touch screen surgeons’ panels incorporating a unique wipe clean anti-microbial silver nitrate coating that provides maximum sterility. The panels enable staff to exercise safe control of the theatre environment through an ergonomic single point of reference, even when wearing surgical gloves. For Chase Farm the bespoke touch screen panels are integrated with 42-inch PACS viewing screens and medical PCs with retractable keyboards. Bender supplied and commissioned the resilient electrical infrastructure for the new Group 2 surgical facilities with safe and secure medical IT (Isolated Power Supply) and Uninterruptible Power Supply (UPS) systems. The fully compliant IPS-UPS system comprises 2 x centralised 400kVA UPS units supporting multiple IPS panels with interleaved circuits to each clinical area. Bender UK Managing Director Gareth Brunton explains: “The Chase Farm hospital project perfectly demonstrates the breadth of equipment, skills and expertise offered by our company in the clinical sector. Our advanced medical IT and UPS equipment provides the safe and resilient infrastructure that underpins the critical services required in Group 2 areas. Creation of the new Chase Farm Hospital has enabled surplus land on the site to be redeveloped for housing and a new primary school to help fund the new hospital. It will include up to 500 family homes and apartments, including key worker accommodation, set within a landscaped environment. For more information on the full range of Bender UK Healthcare products and service, go to https://www.bender-uk.com/solutions/healthcare.